WHAT: From May 26-31, 2013, student and community groups are holding a series of actions to demand Governor Christie and the NJ State Legislature to pass A3509/S2479, which would allow DREAM Act- eligible youth to qualify for in-state tuition and access state financial aid at New Jersey’s public colleges and universities, by the June 30, 2013 state budget deadline. Community groups are urging concerned citizens to take a stand for a person’s right to affordable and quality education, regardless of immigration status. Everyone is invited to participate in the New Jersey DREAM Act Week of Action. Activities range from social media campaigns on Facebook and Twitter to public forums, vigils and rallies across New Jersey. If you’d like to register an event as part of the NJ Dream Act Week of Action, contact Bea Sabino at (201) 779 6886 or email bmb.sabino@gmail.com. For an updated list of events, please visit njtuitionequity.wordpress.com. WHY: The NJTED Campaign launched with a rally at the State House in Trenton on January 8, just before Governor Christie’s State of the State Address. For the past 5 months, the NJ Dream Act campaign has been steadily gaining legislative and community support. Dozens of student groups, community organizations, labor unions and faith-based groups have signed on as endorsers of the campaign. The cities of Jersey City, Passaic, Elizabeth, Plainfield and New Brunswick all passed city resolutions urging the New Jersey State Legislature to enact the passage of A3509/S2479. Additionally, Essex County Freeholders and Union County Freeholders have both signed similar resolutions. The undocumented immigrant population in New Jersey makes up 6.2% of the total state population, making it the fourth-highest rate in the nation. In New Jersey, undocumented immigrants make up 8.6% of the state’s workforce and paid $446.1 million in state and local taxes in 2010. Despite their contribution to the local economy, undocumented immigrants are required to pay out-of-state tuition rates to attend college, and are ineligible for financial aid and scholarships. 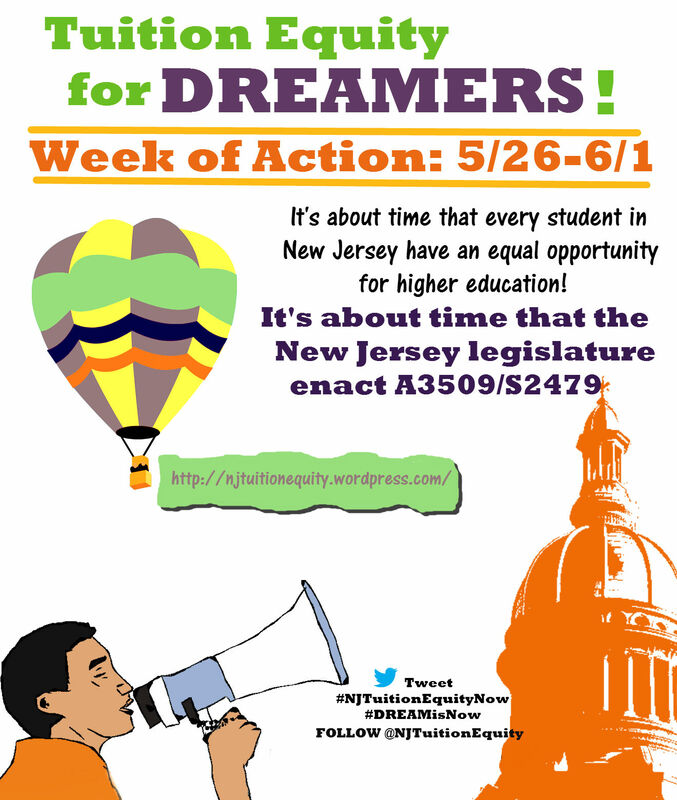 The New Jersey Dream Act Week of Action aims to supplement ongoing legislative visits with a demonstration of the people power behind the call for the implementation of A3509/S2479 in time for the Fall 2013 semester. It is time for New Jersey to join the 14 other states that have enacted similar legislation for aspiring undocumented youth.